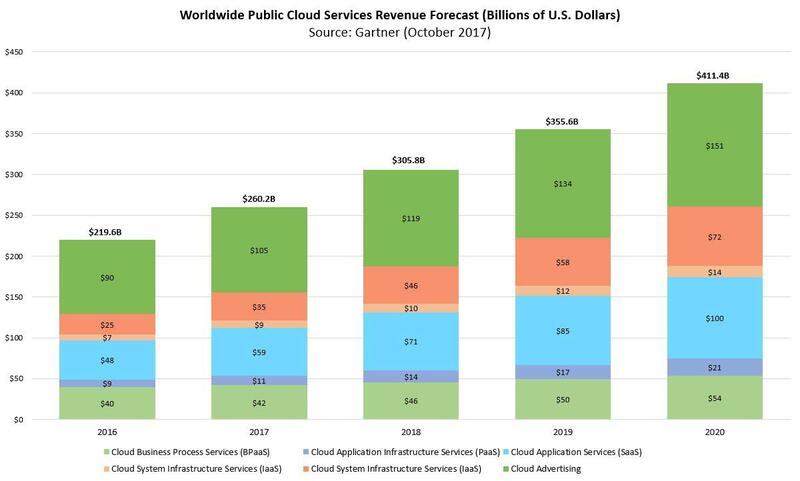 Gartner is predicting the worldwide public cloud services market will grow from $182.4B in 2018 to $214.3B in 2019, a 17.5% jump in just a year. Comparing Compound Annual Growth Rates (CAGRs) of worldwide public cloud service revenue segments from 2018 to 2022 reflects IaaS’ anticipated rapid growth. Average cloud penetration for customers in each of the five segments—all five expect to deploy more in the cloud, although the pace will vary significantly. Transformational. These early cloud computing adopters continue to set the bar for the market, but some are reaching a plateau in adoption. Heterogeneous. The diversity of existing IT environments and workloads leads these customers to take a more measured pace of cloud computing adoption. Safety Conscious. Cloud computing adoption continues to increase for these customers, although at a slightly slower pace. Price Conscious. Cloud computing adoption by price-conscious customers has outstripped expectations as they pursue the economic benefits of moving to the cloud. Most of the growth in cloud adoption will come from laggards, as they become the largest segment in cloud spending by 2022 . Laggards waited on the sidelines while early adopters tested the waters, but have waded in over the past three to five years. Half the growth in cloud spending comes from this group. For cloud technology providers searching for growth from the cloud, this is the category to focus on. Slow and Steady. Most of the growth in cloud computing adoption will come from these customers, as they become the largest segment in cloud spending by 2022. The enterprise SaaS market is now generating $20B in quarterly revenues for software vendors, a number that is growing by 32% per year. Microsoft is in the lead with a worldwide market share of over 17% and is now the leading SaaS vendor primarily due to its leadership in the high-growth collaboration segment. Wikibon projects the True Private Cloud (TPC) worldwide market will experience a compound annual growth rate of 29.2%, reaching $262.4 b by 2027. TPC growth is expected to far outpace the infrastructure-as-a-service (IaaS) growth of 15.2% over the same period. A true private cloud is distinguished from a private cloud by the completeness of the integration of all aspects of the offering, including performance characteristics such as price, agility, and service breadth. The worldwide public cloud services market is projected to grow 17% in 2019 to total $206B, up from $176B in 2018, according to Gartner. In 2018, Gartner forecasts that the market will grow 21%, up from $145B in 2017. The fastest-growing segment of the market is cloud system infrastructure services (infrastructure as a service or IaaS), which is forecast to grow 28% in 2019 to reach $40B, up from $31B in 2018. Software as a service (SaaS) remains the largest segment of the cloud market, with revenue expected to grow 18% to reach $85B in 2019. By 2022, Gartner expects that 90% of organizations purchasing public cloud IaaS will do so from an integrated IaaS and platform as a service (PaaS) provider, and will use both the IaaS and PaaS capabilities from that provider. More than $1.3T in IT spending will be directly or indirectly affected by the shift to cloud by 2022. 28% of spending within key enterprise IT markets will shift to the cloud by 2022, up from 19% in 2018. The largest cloud shift before 2018 occurred in application software, particularly driven by customer relationship management (CRM) software, with Salesforce dominating as the market leader. CRM has already reached a tipping point where a higher proportion of spending occurs in the cloud than in traditional software. Gartner says 28% of Spending in Key IT Segments Will Shift to the Cloud by 2022. Spending on IT Infrastructure for Deployment in Cloud Environments is forecast to Grow 10.9% in 2018, according to IDC. Public cloud data centers will account for a majority of this spending, 65.9%, growing at the fastest annual rate of 11.3%. Off-premises private cloud environments will represent 13.0% of cloud IT infrastructure spending, growing at 12.0% year over year. On-premises private clouds will account for 61.7% of spending on private cloud IT infrastructure and will grow 9.1% year over year in 2018. Long-term, IDC expects spending on off-premises cloud IT infrastructure will grow at a five-year compound annual growth rate (CAGR) of 10.8%, reaching $56B in 2022. Public cloud data centers will account for 83.6% of this amount growing at a 10.6% CAGR while spending on off-premises private cloud infrastructure will increase at a CAGR of 11.4%. Combined with on-premises private cloud, overall spending on cloud IT infrastructure will grow at an 10.9% CAGR will surpass spending on non-cloud IT infrastructure by 2022. Spending on on-premises private cloud IT infrastructure will grow at a 11.5% CAGR, while spending on non-cloud IT (on-premises and off-premises combined) will decline at a 2.7% CAGR during the same period. Building the infrastructure to support cloud computing now accounts for more than a third of WW IT spending, according to IDC. Spending on traditional, in-house IT continues to slide as computing workloads continue to move to the cloud, whether that is public cloud services offered by vendors or private clouds built by enterprises themselves. Gartner predicts that half of global enterprises using the cloud now will go all in by 2021. According to Gartner, global spending on cloud services will reach $260B this year up from $219.6B. Highest spending categories overall are: online backup/recovery (15%), email hosting (11%), online productivity (9%), and web hosting (9%). Companies with 500+ employees are putting a greater percentage of their cloud budgets towards cloud storage/file-sharing services, developer tools, and IT management tools. Smaller companies plan to put a bigger portion of their budget toward web hosting and email hosting – companies with less than 100 employees see spending on email hosting services rising from 11% of their cloud budget in 2018 to 19% in 2019. When it comes to managed services budgets for companies in North America, here’s the breakdown: managed hosting (13%), storage/backup (9%), and security (10%) top the list. When it comes to managed services budgets for companies in North America with 5,000+ employees, here’s the breakdown: managed hosting (8%), storage/backup (8%), and security (10%) top the list. New data from Synergy Research Group shows states that the cloud market passed the $250B milestone in 2018. The cloud market grew by 32% from 2017. The IaaS & PaaS services segments both grew at 50%. Hybrid cloud management software grew at 41%. Enterprise SaaS and public cloud infrastructure both grew at 30%. Hosted private cloud infrastructure services grew at 29%. Seventy-three percent of organizations have at least one application, or a portion of their computing infrastructure already in the cloud – 17% plan to do so within the next 12 months. The average cloud budget is up from $1.62 million in 2016 to $2.2 million today. This does change by company size with enterprise organizations investing $3.5 million and SMBs investing $889,000 (which is up from $286K in 2016). More than one third of respondents (38%) shared that the IT department feels pressure to migrate 100% to the cloud. Organizations are utilizing a mix of cloud delivery models. Currently the average environment is 53% non-cloud, 23% SaaS, 16% IaaS and 9% PaaS; however, will evolve to only 31% non-cloud within 18 months. Forty-two percent of organizations are using multi cloud. The top two benefits of a multi cloud strategy are increased cloud options (59%) and easier and faster disaster recovery (40%). Software as a Service (SaaS) is still the most common cloud service model across companies of all sizes. Specifically, 89% of companies use SaaS somewhere in their IT environment – 73% of companies Infrastructure as a Service (IaaS) and 61% use Platform as a Service (PaaS). In the next 18 months, though, non-cloud delivery will account for less than a third (31%) of the average IT environment, while SaaS will drive 33%, IaaS 22%, and PaaS 14%. Improving customer support and services (57%). Companies say they use SaaS solutions to save IT staff time and ultimately improve the customer experience. IDG respondents also point to the current and future impact of cloud investments on the structure and operations of the IT department. Public cloud platforms, the fastest growing segment, will generate $44 billion in 2018. By the end of 2017, Forrester expects that half of all global enterprises will rely on public cloud platforms. Forrester predicts SaaS vendors will compete more at the platform level, running portions of their services on Amazon AWS, Microsoft Azure, Google Cloud Platform (GCP) or Oracle Cloud in 2018. Given the increased demands for application customization, combined with the convergence of digital technologies such as IoT and AI, Forrester is predicting that SaaS vendors will de-prioritize their platform efforts to attain global scale and select from AWS, Azure, GCP, or Oracle Cloud. Top – Alibaba Cloud, Amazon Web Services, Google, IBM, Microsoft and Oracle. This emerging type of computing brings more agility and more complexity. Startups are now focusing on how containers can work together and how these containers can be secured. The future will be about how to manage containers at scale. Compelling applications will emerge in enterprise industries including food, retail and aviation. Software and payments used to live apart but now companies are taking a share of payment processing from software vendors and merchant acquirers. Organizations will place greater emphasis on what data can provide to their organization and how they can make it actionable. Other large tech companies are expected to follow Amazon’s lead (Alexa) and invest in expanding their voice capabilities. 2017 served as a stark reminder that company values and the voice of the employee matter now more than ever. Founders will place greater emphasis on establishing the cultural heart of their companies earlier rather than later. Silicon Valley is still the center of innovation, but other cities are thriving including Criteo (Paris), ServiceTitan (Glendale, California) and Shopify (Canada). statistically relevant patterns of regional development. In 2017, over 60% of companies were located in North America (United States 59.57%, Canada 3.22%). Silicon Valley and it’s surrounding area accounted for just over 16%. New York represents almost 6%. Southern California accounts for just over 5%. Boston and London provide just over 4%. Asia as a whole represents almost 8%. The Middle East has almost 3%. of 2020 – a compound annual growth rate (CAGR) of 19%. A Bain & Company study found that from 2012 to 2015, cloud demand accounted for 70% of IT market growth, and is expected to represent 60% of new growth through 2020. The public cloud services market is expected to grow at 20% in 2018 – revenue of $187B. Growth in 2017 was 20%. The SaaS market is projected to reach $71B in 2018. Infrastructure-as-a-Service (IaaS) is forecast to grow the fastest – 36.6% in 2017 or $35B. The Asia-Pacific region is forecast to reach a CAGR of over 30% until 2022. Gartner expects Software-as-a-Service (SaaS) revenue to grow from $59B in 2017 to $100B in 2020. IaaS and PaaS spending are expected to grow at a CAGR of 30.1% and 32.2%, respectively. SaaS is expected to continue to dominate the cloud computing space – capturing nearly two-thirds of public cloud spending in 2017 and approximately 60% in 2020. SAP has a 10.2% share of the CRM market. Oracle, Microsoft, and Adobe Systems round out the top 5 CRM vendors, in terms of market share. MarketsandMarkets shows growth in the cloud billing market growing at a CAGR (compound annual growth rate) of 23.9% to become a $16.6B market by 2021, as compared to $5.7B in 2016. Among cloud billing services, SaaS (software-as-a-service) is gaining momentum due to its potential to offer customized and innovative services. Synergy Research Group research shows that operator and vendor revenues grew to $148B for the four quarters ending September 2016 -25% on an annualized basis. From 2103 through 2018, spending on cloud computing infrastructure and platforms is expected to grow at a 30% CAGR, compared with 5% growth for the overall enterprise IT. Goldman Sachs estimates that Amazon has taken in approximately $4B in revenue, or 26% of the IaaS and PaaS markets. The graphic below, provided by Pacific Crest Securities(registration required) represents SaaS companies that have more than $2.5M in annual revenues. The fastest growing segment of those surveyed were SaaS companies whose annual revenues were between $7.5M – $15M, over 60%. The growth rate of SaaS companies surveyed whose revenues were in excess of $100M had a median growth rate of 28%. Overall, the median company in the survey devoted 30% of their CAC to marketing expenses, with the balance (70%) allocated to sales. However, ecommerce driven companies have a much greater reliance on marketing and those companies spent 65% of the median company’s CAC budget on marketing. Based on the survey respondents, there was a clear correlation between sales and marketing spend and the overall growth rate of the company. Excluding SaaS companies with less than $2.5M in annual revenues, the median growth rate for SaaS companies surveyed was 35%. Below is the detail of growth rate by company size. Excluding SaaS companies with less than $2.5M in annual revenues, the median growth rate for SaaS companies surveyed was 36%. Below is the detail of growth rate by target customer. Based on the SaaS companies surveyed, 15% of new ACV was derived from up-sells and expansion sales. In general, there was a direct correlation between annual revenues of the SaaS companies surveyed and the contribution from up-sells and expansion sales (exception of companies with revenue greater than $75M annually). Gartner expects that more than $1T in IT spending will be directly or indirectly affected by the shift to the cloud by 2020. By 2020, Gartner expects that 43$ of Business Process Outsourcing spending and 37% of application software spending will shift at will shift to the cloud . What’s driving the shift in IT spending towards the cloud? Gartner expects that the most significant shifts in IT spending to the cloud include Business Process Outsourcing (BPaaS) and application software. Gartner expects 43% of all IT spending on Business Process Outsourcing (BPaaS) to be cloud-based through the forecast period (2020). In Gartner’s Go to Market Cloud Computing Research, the expectations is that more than $1T in IT spending will be impacted by the cloud by 2020 and that should benefit startups that are built from the cloud up. Gartner expects at least $1 trillion in IT spending to be impacted over the next five years as enterprises move to the cloud. The absolute dollar amount is stunning and could therefore be considered one of the most disruptive forces of IT Spending. The adoption of cloud computing has moved to the mainstream market (early majority) and it represents a significant percentage of total IT spend. Below are some highlights from the report. The aggregate amount of cloud shift in 2016 is estimated to reach $111 billion, increasing to $216 billion in 2020. This Pacific Crest 2015 Private SaaS Company Survey provides insights into private SaaS companies and it is the sixth such survey Pacific Crest has completed. The median revenue growth achieved in 2014 was 44%, while the median projected growth for 2015 is 46%. Gross churn was higher for inside, but net dollar retention was also higher, suggesting more success with “land-and-expand”. Approximately 30% of companies derive some amount of new ACV from “freemium” strategies, though virtually no one drives their business on it. “Try Before You Buy” is much more commonly used: 60% derive revenues through this strategy, and 30% derive the majority of their new ACV through “Try Before You Buy”. 70% of participants headquartered in the U.S.